It is not a large town. The population is about 9,000 people. The atmosphere recalls another less complicated time. 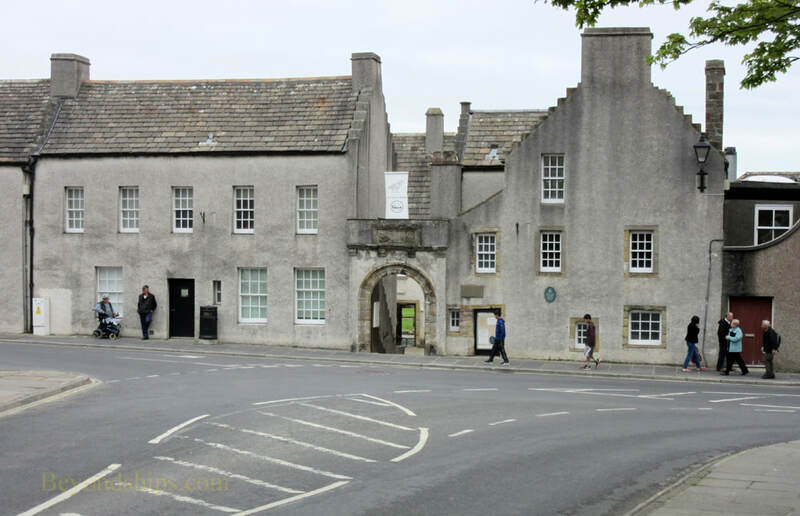 The town's principal attractions are the Cathedral, the Bishop's Palace and the Earl's Palace. 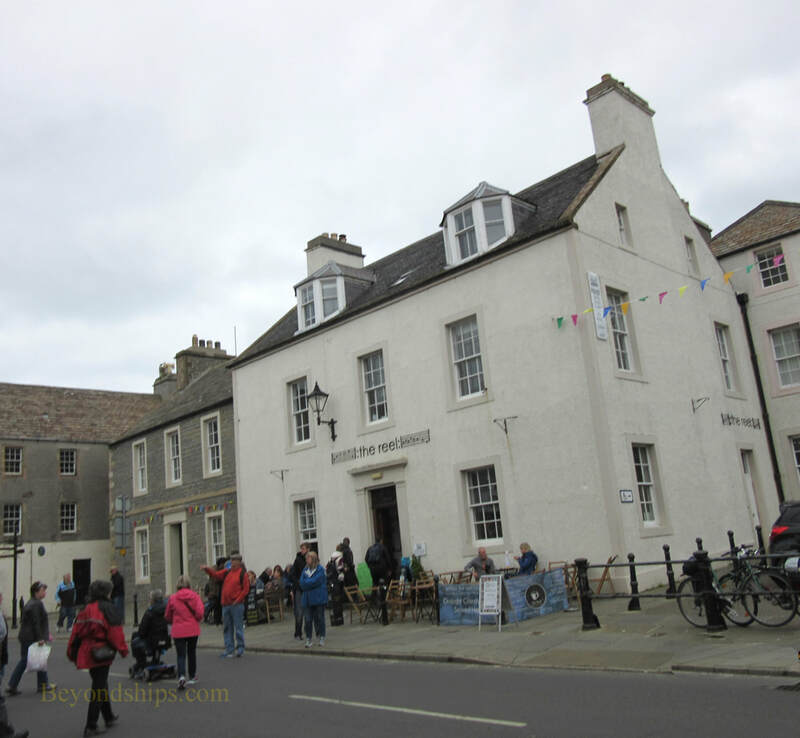 In addition, there is an Orkney Museum as well as shops and pubs. 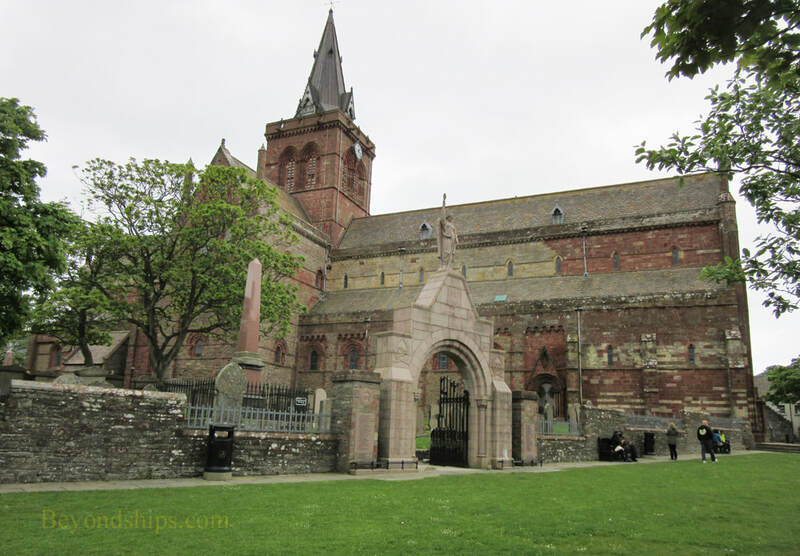 St. Magnus Cathedral is a Romanesque church in the heart of Kirkwall. Known as “the light of the north,” it is the most northerly cathedral in Britain. This is a viking cathedral. 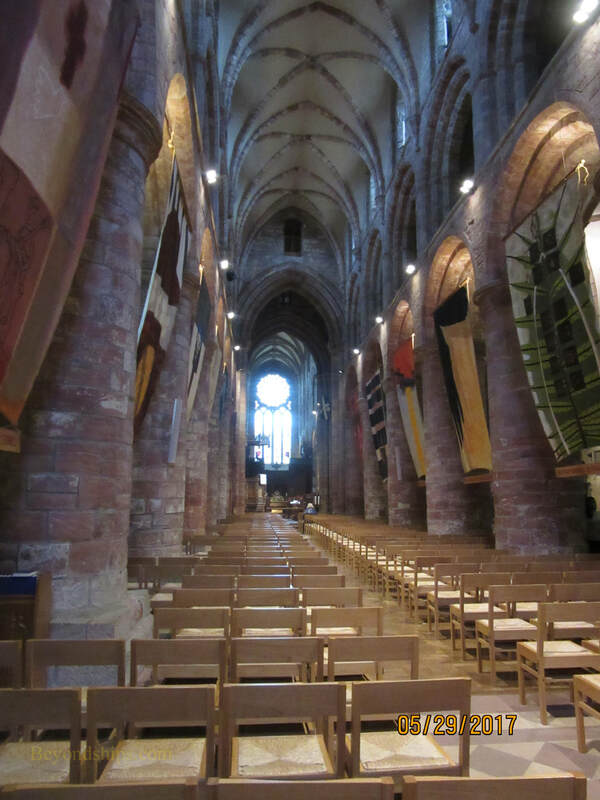 It was begun in 1137 by the viking Earl Rognvald as the final resting place for the relics of his uncle, St. Magnus, who had been a viking earl of these islands and who had been canonized in 1135. 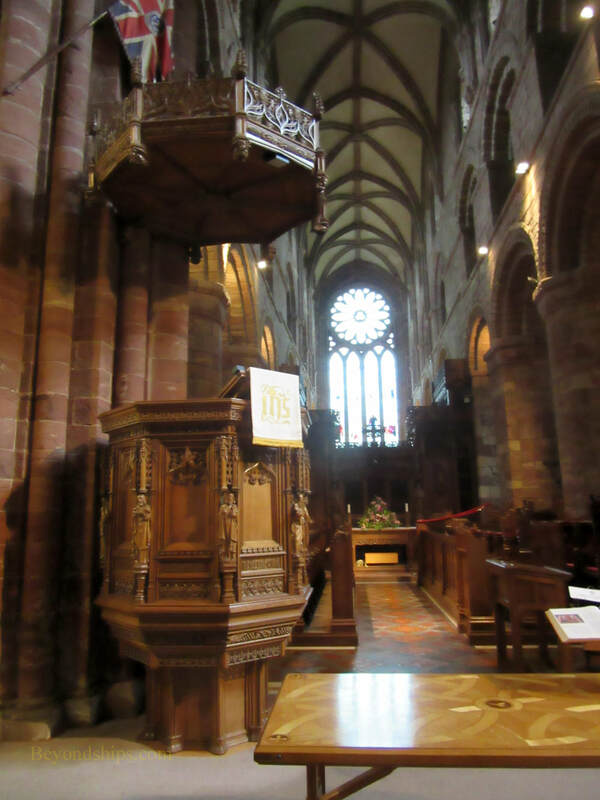 The cathedral remained under the archbishop of Tronheim, Norway until 1472, when Orkney was annexed by Scotland. By order of King James III, the cathedral belongs to the burgh of Kirkwall, not the church. During the reformation, the cathedral's organ, treasures and vestments were taken away and the wall decoration covered in whitewash. The cathedral emerged as a Presbyterian church. In the early 20th century, a major restoration was undertaken. This included the addition of the current steeple and the addition of stained glass windows. Nonetheless, the interior of the cathedral still has a medieval feel. The building is made out of red and yellow sandstone. Wind and rain has sculpted some of the soft stonework into almost abstract shapes. Next to St. Magnus Cathedral is the ruins of the Bishop's Palace. Begun around the same time as the cathedral, the palace was modeled after the royal palaces of Norway. It had a large rectangular oom on the upper floor and storage areas below. The palace was subsequently expanded. Its round tower was added in the 1500s by Bishop Robert Reid, who also founded Edinburgh University. 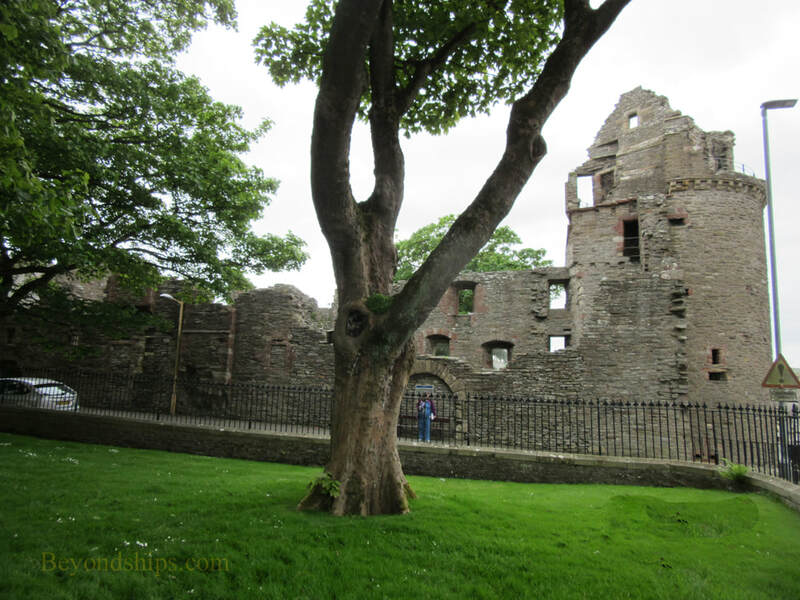 Across from the Bishop's Palace are the remains of the Earl's Palace, considered one of the finest Renaissance buildings in Scotland. 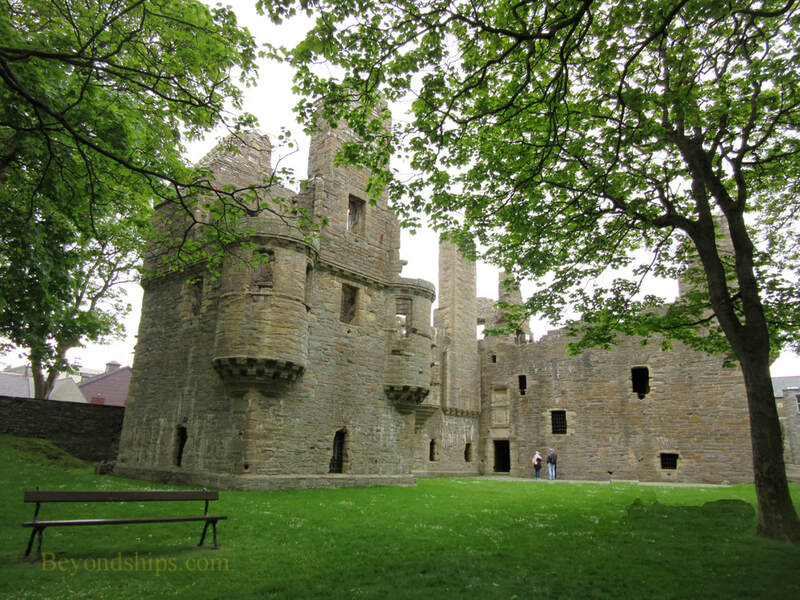 This structure was built around 1600 for Patrick Stewart, Second Earl of Orkney. An illegitimate cousin of King James VI of Scotland (who was also James I of England), "Black Padie" had a reputation for violence, cruelty and living beyond his means. His plan was to incorporate the Bishop's Palace into his own palace. However, debt forced him to return the Bishop's Palace to the bishop. After Patrick's arrest for treason, his son Robert seized both palaces. An army was sent to capture him and the two places were reduced to ruin during the siege.